Welcome to the official blog for Babcock Ranch! Here, you'll find stories about Babcock, solar power, nature, innovation, or anything we think would be cool to share! Something you'd like to see? Let us know! Founder’s Festival Weekend: Thank You! A crowd of 15,000 to 20,000 attended the first public event held at Babcock Ranch on March 11 and March 12. To all our followers and those that attended the event: we thank you! Crowds far-exceeded what our event organizers predicted and we will do our best to learn from that experience to address future parking and traffic needs for event-goers. Health and wellness took the early lead at the Babcock Ranch Founder’s Festival on March 11 and 12. It’s no surprise that the first event at Babcock Ranch’s Founder’s Festival was a 10k, 5k, and 1-mile run. 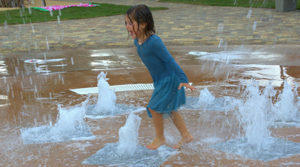 Health and wellness is a centerpiece of the community, designed so that residents can walk, jog or ride their bikes to Babcock Ranch’s wellness center and other attractions. 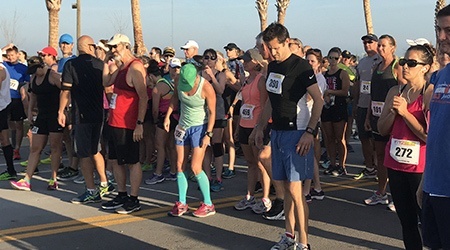 More than 200 runners toed the line at the inaugural Sun Run 5K and 10K races at 7:30 a.m. on March 11 and the pancake-flat course made for some great times. The youngest participant was 7 years old and the oldest was 75, an indication that Babcock Ranch’s appeal cuts across generations. Robert Strong, 35, of Fort Myers, was the winner of the 10K race in 38:03, running a six-minute pace. Beth Schadd, 43, of Bonita Springs, led the women with 46:22. The Sun Run kicked off the Founder’s Festival celebration that attracted more than 10,000 people to Babcock Ranch, the first solar-powered town in the world that one day will be home to 50,000 residents. The community is located 20 minutes from Fort Myers along scenic State Road 31 just north of the Lee County Civic Center. 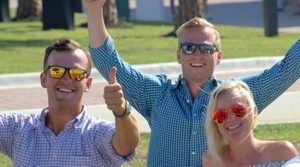 Over the two-day festival weekend, visitors celebrated the completion of Founder’s Square event lawn, band shell and boardwalk where JP Soars & The Red Hots and the Ben Allen Band entertained the crowds spread out on blankets and lawn chairs. 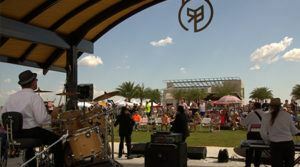 Their performances marked the first of many such community events in the new downtown area. The bands were part of the many attractions at the Founder’s Festival. Food trucks, a farmer’s market, kids’ games and model-home tours provided hours of fun. Visitors explored some of the new amenities at Babcock Ranch, including a fishing pier, a dog park and the first four miles of the new town’s trail network called Sunset Trail. The trail network will eventually total 50 miles, equivalent to the distance between Fort Myers and Naples. Executives with Kitson & Partners, the development firm, were on hand to greet visitors and the Port Charlotte High School Marching Band started up after the ceremonial ribbon cutting. The real fun started when the kids’ games got underway on the lawn: egg toss, sack races and tug of war never go out of style. For the adults, visitors were treated to an art show on the new boardwalk. The DeSoto Arts & Humanities Council and the Peace River Arts & Humanities Council featured active painting by local artists. Families enjoyed visiting the new buildings on Founder’s Square, the central gathering place in downtown Babcock Ranch. They toured Woodlea Hall, Babcock’s first civic building on the western edge of the square. Outdoor enthusiasts explored Curry Creek Outfitters for the latest gear for fishing, biking, hiking and kayaking. Many made a date to come back to Table & Tap, the indoor-outdoor restaurant with beer garden adjacent to the green. If you missed Founder’s Festival, don’t worry – there is more to come! Make sure to check back to our events calendar for more events as they’re held. For more information or to schedule a tour of Babcock Ranch, contact us here or give us a call at 1-877-484-4434.